Green up/Cash out! - Bet On Droid! Am i right that the Green/Cashout function is not working right when you set stakes? I mean it only hedges until the stake you put into settings? for example i took 100 so it will green/cashout for 100 what might not be enough to fully green up the same amount on every selection? that means i would have to hit green/cashout again? Can this be changed that 1 click is enough to green up? If it's working and i'm wrong i hope someone can help me to use it the right way! From my understanding green up functionality works fine for any set of bets. to place order for green up with 0.28$ net profit for any runner/outcome. hm. ok worked for me later... but today i dont understand this, or maybe i have a wrong setting! why i get shown red figures on Gavrilova? Some setting wrong? 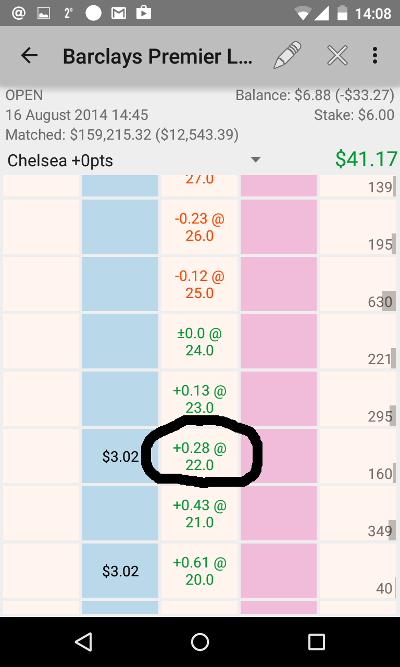 would be happy if clicking the middle row (odds) would make me green on both sides(same amount) every time, apparently thats not the case here. Yes, it looks really strange. Let me some time to investigation.